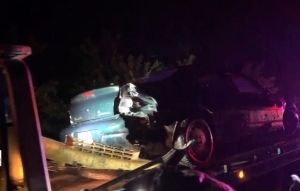 FRESNO COUNTY, CA (KMJ) – Sanger Police are looking for a woman after officers say she got away following a chase. It happened around 3:15 a.m. on Tuesday morning near Bethel and Central in Sanger. According to police, a call came in about someone lurking around the area. Police found a woman who they recognized from a different case. She drove off and led them on a chase to Bethel and Central where she crashed her car. Police say she hit a telephone pole and took off running into a field nearby. Around 5:00 a.m., Sanger Police called off the search due to rain and mud. Police are not releasing the woman’s age or identity at this time.